have many activists, are the parties of Melenchon and Le Pen, but for all the other parties, the election results depend strictly on the time spent on television. TV news feeds on newspapers: there are virtually none – or very few – field journalists on television; in fact, TV channels most often take up what’s in the papers. 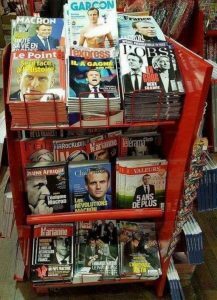 Now, in France, the rich have bought all the newspapers; there are nine billionaires who have bought all the paper newspapers of the country. I do not talk about the internet where there are still free journalists. But the bulk of the population does not look at the internet; most people are not politicized and watch TV, which is the reflection of what is in the newspapers, which, then, reflect the thought of billionaires. This is very serious because instead of being informed by journalists, public opinion is distorted and uninformed. This is very problematic because a democracy demands that citizens be enlightened. True journalists are the sentinels of the people. they do not want to hear about politics. In my opinion, when they say that, they talk about politicians, and they do not realize that their actions are extremely political in the best sense of the word. What the Yellow Vests do is not politicking; they take care of what it is necessary to do, what we should do in society. They know that there are people of the left and right among them and they are very careful that it is not told, that no one has a flag of left or right to brandish. This is decisive. This is what is historic, it is a unitary movement. What prevents the people from winning are the divisions, it is the discord on legislative subjects, on topics we are used to discussing when we have no power to decide. It is not we who decide, it is the elected. We are used to arguing for nothing because, in any case, we do not decide. From what I understand, the idea of the Yellow Vests is: no discord, we remain united. it is not at all legislative, it is constituent. It is not a question of saying “here is a law we want”, it is a question of saying “this is how we want to write the laws ourselves”. It is extremely subversive. When I saw this, I realized that it was something very important and I told them: “This line, in your grievances, is completely different from all the rest. If we get that, we will have everything else. That is to say, we will have the means to vote ourselves the laws that we will find important.” This point, therefore, deserves priority because, if we ask for forty things or sixty different things, even if we are very numerous, the force exerted on each grievance is weak, our strength being divided on each of these points. And it will be enough for elected officials to grant us two or three of these requests to get rid of us and make us go home. 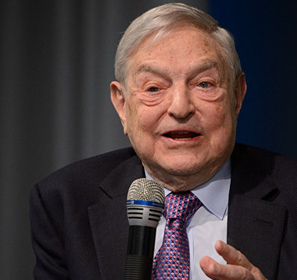 Instead, if we turn these forty or sixty requests into two requests, one on the Citizen Initiative Referendum that will give us access to everything else, and the second, on a well-targeted financial aspect (so that the poorest will immediately stop suffering so much); if we focus our efforts, then we will have more strength to win. 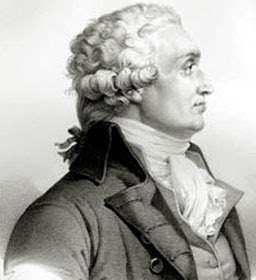 popular initiative, Condorcet (pictured) already described it. So it was Condorcet who was a visionary when he defended, in the eighteenth century, during the French Revolution, the referendum of popular initiative. And it was Thomas Paine who, also in the eighteenth century (in “The Rights of Man”, Chapter 4 “Constitutions”), was a visionary in hammering that the constitution can in no way be a contract between representatives and those who are represented, but exclusively between the represented! You cannot put an evolution as deep as the RIC to the credit of a single person, it is collective. Ideas belong to those who seize them. What is happening is that there is, especially, it seems to me, a novelty in the history of ideas: the connection of humans through the internet makes every active human a neuron. This allows us to organize as if we were a collective brain, something that we have not been able to do thus far. the thieves of speech (the so-called journalists who are not journalists at all but propagandists, the voice of the billionaires), to argue about the message, because it will be seen right away that they are thieves of power and enemies of the people. Since they cannot fight against the message that is too strong for them and they are cowards, they go after the messengers. They slander, they lie, trying to discredit people, to avoid talking about content. But if you look at the comments, below the publications of the thieves of speech, you see that the readers are not fooled. Mistrust with regard to the so-called “journalists” is huge. In my opinion, the Yellow Vests should be careful because violent action too early on can kill the movement. The extreme hostility of the media towards the Yellow Vests and the dishonesty of the elected officials and the government towards them, given the power of their idea, should lead the Yellow Vests to advance their idea without taking into account at all elected officials and journalists: “We do not care, they say, we do not even read them anymore, we do not need them to prepare the self-institution of society. We are going to re-institute ourselves and we do not need the help of journalists and parliamentarians.” It’s very powerful, actually. We just have to become numerous, that the non-Yellow Vests join the Yellow Vests. And the situation is favourable because 80% of the citizens have been, for decades, in favour of the Citizen Initiative Referendum. Every time they are polled, people say they want the RIC. 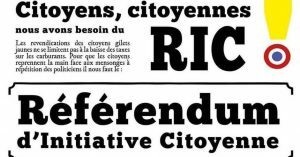 So, the population is ready to follow the Yellow Vests: if they make the Citizen Initiative Referendum the main request, with the addition of halving the price of basic necessities, which will help everyone, the population will more easily agree. The simplification of requests: 1) the referendum of popular initiative in all matters written by ourselves, 2) subsidized basic necessities whose price falls by half; it’s so simple and strong that anyone can advocate it and convince their neighbours to make the movement grow, and there is no need to learn the argument for forty-point grievances. It is enough to focus on two essential things that are simple and strong, and it facilitates the expansion of these ideas throughout society. concentrated, it is disseminated; it does not offer a grip. Traffic circles, tolls, they are absolutely everywhere in the country. The movement is completely elusive. When the police come to hunt the Yellow Vests, they come back the next day, there or elsewhere. And it’s like that everywhere in the country. They are elusive; this movement has an incredible power. 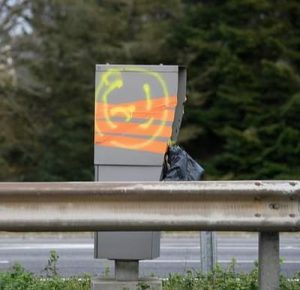 If, instead of slowing the highways, instead of blocking the roads, instead of going to stop the poor people from working, if they spend time in the media to deliver their message, if the Yellow Vests release public services and highways to make them free of charge, if they invent actions that are useful to people and are not annoying, then the movement will become stronger and stronger and there will be more and more non-Yellow Vests that will become Yellow Vests.